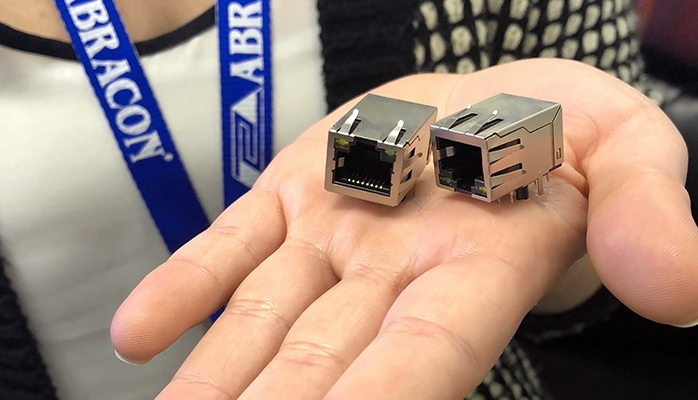 The ARJM11 series of RJ45 jacks with internal magnetics supports a wide range of configurations in 10/100Base-T, 1000Base-T, 2.5GBase-T and 5GBase-T applications. This series offers the ability to mix and match physical orientation of the tab, pin layouts, EMI fingers, LED colors and plating options while providing PoE and PoE+ options for 10/100Base-T rates. All configurations in the product series support paste-in-hole (PIH), a technology that allows through-hole components to be compatible with surface mount reflow assembly processes. All devices are rated to 0°C to 70°C or -40°C to 85°C operating temperature range. For more information, contact Abracon.